On page 40 of Sega Sammy Holdings’s public earnings presentation, which you can read in English here, the parent company of Sega has essentially cemented ports of Sonic Generations coming to the Nintendo 3DS and PC along with the already confirmed XBOX 360 and PS3 ports. 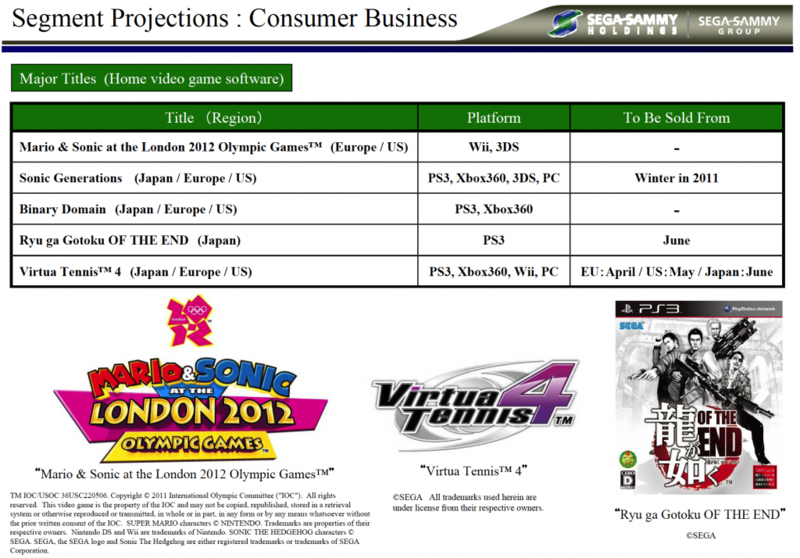 Generations, along with Mario and Sonic at the London 2012 Olympic Games, is listed as a major title for the company in the next fiscal year. The platform listing was made on both Japanese and English language reports, so this doesn’t appear to be a misprint. If it holds, the news confirms earlier murmurs of the game coming to the 3DS, and it’s also welcome news for desktop users who have been yearning for a recent Sonic port for some time now. We will bring you more as it becomes available. Thanks to Woun for the original tip from the Japanese listing.